Dow AgroSciences hasn’t set up camp at the Farm Progress Show in ten years. But, this year, the company says it has some exciting new technology to present and couldn’t skip out on offering farmers in Progress City a first-hand look. 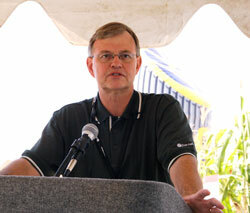 Dow AgroSciences Global Corn Business Leader Tom Wiltrout kicked off a press conference introducing the company’s Herbicide Tolerant Traits technology, which has been under development for 2 to 3 years. Tom says the the traits have already been introduced in corn. He adds that Dow AgroSciences has also overcome limitations for the 2,4-D herbicide, allowing farmers to capitalize on what he calls the most affordable Broadleaf Weed control you can get.